This review is of the cut shown at the BFI London Film Festival in October 2018 – the UK release date is currently listed for January 4th 2019. When Life Itself debuted to abysmal reviews – to date, it sits at a mawkish 11% on Rotten Tomatoes – and even worse box office (it currently has the second-worst opening weekend for a movie debuting in over 2,500 cinemas, with a gross of just over $2 million), writer-director Dan Fogelman was quick to place the blame on, in his own words, “white male critics who don’t like anything that has any emotion”. Now, Fogelman is correct in that the field for film criticism nowadays is shockingly lacking in diversity, with a recent study by the University of Southern California’s Annenberg Inclusion Initiative showing that female critics make up about 22% of all criticism roles, whilst the figures are even lower for minorities. These are horrific figures that drastically need to be improved, and in that aspect Fogelman is absolutely right to address that problem. However, it really doesn’t matter if you’re a white male critic, a female one, or one from any kind of ethnic background, because at the end of the day, anyone can see that Life Itself really is that bad of a movie; it is a deathly dull, sometimes unintentionally funny, and supremely self-righteous melodrama that pulls no punches when it comes to wanting viewers to shed a tear, but it just so happens that those punches are directed towards your tender nether regions before then aiming straight for your fragile face. 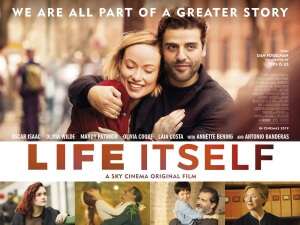 Spanning across several generations of family over many years – yet always looking and feeling like it’s the exact same year – this convoluted plot first sees depressed and manic screenwriter Will Dempsey (Oscar Isaac) relay to his therapist (Annette Bening) the intricate details of his assumedly failed marriage to Abby (Olivia Wilde), the truth of which should be made completely obvious to everyone and anyone who first sees this film. We then follow Will and Abby’s rebellious offspring Dylan (Olivia Cooke) for a little while, before then cutting to an entirely different plot altogether which sees Spanish olive picker Javier (Sergio Peris-Mencheta) woo and later have a child with his girlfriend Isabel (Laia Costa), in a relationship that turns unbelievably tense after the olive garden’s landowner Vincent (Antonio Banderas) begins becoming a part of their lives. How it all ends up tying together is exactly the kind of tacky and preposterous way you would imagine any self-important screenwriter would try and link their stories together, which I really don’t want to get into here because, quite honestly, you have to see how bad this movie can get. Be warned, though, for it is both hilariously bad – in part thanks to the laughable ways this movie suddenly introduces mortality into the picture, and also some of the several thousand trite and treacly monologues all throughout the film which are so up their own asses they’re practically exiting from the mouth – but also one of the most deathly dull things I’ve seen in such a long time. I wasn’t joking around when I mentioned the amount of monologues in this film, some of which go on for so long that you’d swear next year’s BFI London Film Festival was now only mere weeks away from kicking off; there is one scene between Antonio Banderas and Sergio Peris-Mencheta that goes on for what feels like several hours, where everything is told, and never shown, every intricate detail about Banderas’ past before finally getting to his point that could have taken him seconds to get to. It’s bad enough that this whole movie negates the one fundamental rule of movie storytelling – show, don’t tell – but to replace it with tedious and long-winded monologues about everything from the unreliable narrator to Bob Dylan to whatever the hell Banderas is going on about, which feel as though they were written by the most pretentious screenwriting student at the most lucrative of film schools, is going one step too far. I’ll admit, I have not seen Fogelman’s hit TV show This Is Us, which this movie is desperately being sold to audiences as in a vain attempt to get people to see it, but if it’s anything like this, then I have no idea how so many people are falling for such horrendous and convoluted emotional manipulation, coupled with some of the most smug and artsy-fartsy writing I’ve seen in a major release in such a long time. You have to feel pity for these actors, because they really are trying their hardest to make this all work; great actors like Oscar Isaac, Mandy Patinkin, Annette Bening, Antonio Banderas and even Samuel L. Jackson who shows up early in a cameo that needs to be seen (and heard) to be believed, are all left woefully stranded with material that makes their characters seem like the most detestable and pretentious people you could ever meet in New York City, yet they are all trying to make it work as best as they can, even if hardly any of it leaves an impact. You wish that they were all working from a script that wasn’t so full of itself that it could let them actually act instead of spout the most inane dialogue you could hear in a melodrama this side of Collateral Beauty. There’s so much more to this movie that I just don’t have room to get into, but I will say that as one of the all-too-many white male critics that Fogelman has blamed for the movie’s poor performance, I don’t think we’ve gone far enough in what was essentially a mercy killing, for the greater good of the general movie-going community. Life Itself is a mesmerizingly pretentious and self-important melodrama that strands its solid cast with a script that dives way too deep into long and treacly monologues that get more and more tedious as the film slowly plods along.